BEHIND THE SCENES WITH FRED DAME Each month, Master Sommelier Fred Dame, Vice-President of Prestige Accounts, American Wine & Spirits, talks to some of California's most prominent professionals. 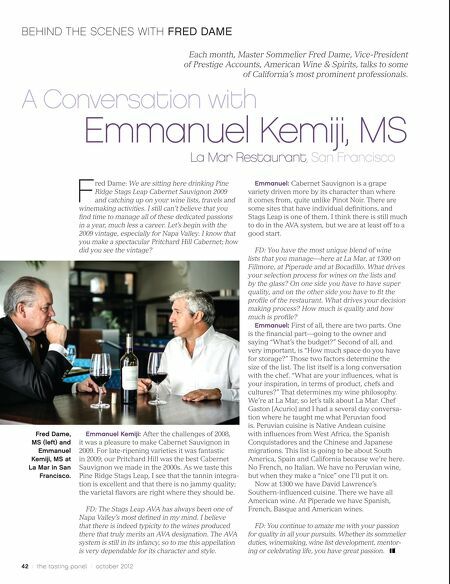 A Conversation with Emmanuel Kemiji, MS La Mar Restaurant, San Francisco F red Dame: We are sitting here drinking Pine Ridge Stags Leap Cabernet Sauvignon 2009 and catching up on your wine lists, travels and winemaking activities. I still can't believe that you fi nd time to manage all of these dedicated passions in a year, much less a career. Let's begin with the 2009 vintage, especially for Napa Valley. I know that you make a spectacular Pritchard Hill Cabernet; how did you see the vintage? Emmanuel: Cabernet Sauvignon is a grape variety driven more by its character than where it comes from, quite unlike Pinot Noir. There are some sites that have individual defi nitions, and Stags Leap is one of them. I think there is still much to do in the AVA system, but we are at least off to a good start. FD: You have the most unique blend of wine lists that you manage—here at La Mar, at 1300 on Fillmore, at Piperade and at Bocadillo. What drives your selection process for wines on the lists and by the glass? On one side you have to have super quality, and on the other side you have to fi t the profi le of the restaurant. What drives your decision making process? How much is quality and how much is profi le? Emmanuel: First of all, there are two parts. One Fred Dame, MS (left) and Emmanuel Kemiji, MS at La Mar in San Francisco. Emmanuel Kemiji: After the challenges of 2008, it was a pleasure to make Cabernet Sauvignon in 2009. For late-ripening varieties it was fantastic in 2009; our Pritchard Hill was the best Cabernet Sauvignon we made in the 2000s. As we taste this Pine Ridge Stags Leap, I see that the tannin integra- tion is excellent and that there is no jammy quality; the varietal fl avors are right where they should be. FD: The Stags Leap AVA has always been one of Napa Valley's most defi ned in my mind. 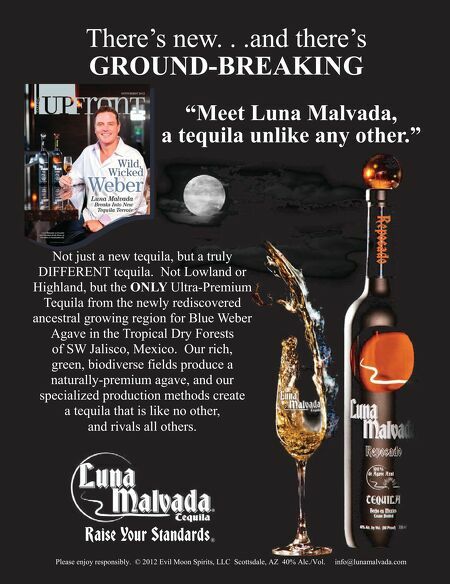 I believe that there is indeed typicity to the wines produced there that truly merits an AVA designation. The AVA system is still in its infancy, so to me this appellation is very dependable for its character and style. 42 / the tasting panel / october 2012 is the fi nancial part—going to the owner and saying "What's the budget?" Second of all, and very important, is "How much space do you have for storage?" Those two factors determine the size of the list. The list itself is a long conversation with the chef. "What are your infl uences, what is your inspiration, in terms of product, chefs and cultures?" That determines my wine philosophy. We're at La Mar, so let's talk about La Mar. Chef Gaston [Acurio] and I had a several day conversa- tion where he taught me what Peruvian food is. Peruvian cuisine is Native Andean cuisine with infl uences from West Africa, the Spanish Conquistadores and the Chinese and Japanese migrations. This list is going to be about South America, Spain and California because we're here. No French, no Italian. We have no Peruvian wine, but when they make a "nice" one I'll put it on. Now at 1300 we have David Lawrence's Southern-infl uenced cuisine. There we have all American wine. At Piperade we have Spanish, French, Basque and American wines. FD: You continue to amaze me with your passion for quality in all your pursuits. Whether its sommelier duties, winemaking, wine list development, mentor- ing or celebrating life, you have great passion. On the Scene: Beam's Spirits Confidential L.A.